Yakisoba, pan-fried noodles tossed with vegetables, thinly sliced pork, and a sweet and savory sauce, is one of my favorite things to buy from the food vendors at a Japanese matsuri (festival). Although summer in Japan is miserably hot and humid, I find myself missing it terribly. The summer conjures up memories of watching Squirrel lick sticky syrup off of her chubby baby fingers as we shared kakigori (Japanese shaved ice), of fantastic hanabi displays (fireworks) over the Tokyo Bay, and of the summer matsuri, replete with all of my favorite foods being sold by vendors on streets crowded with people milling about clad in brightly colored yukata (summer cotton kimonos). 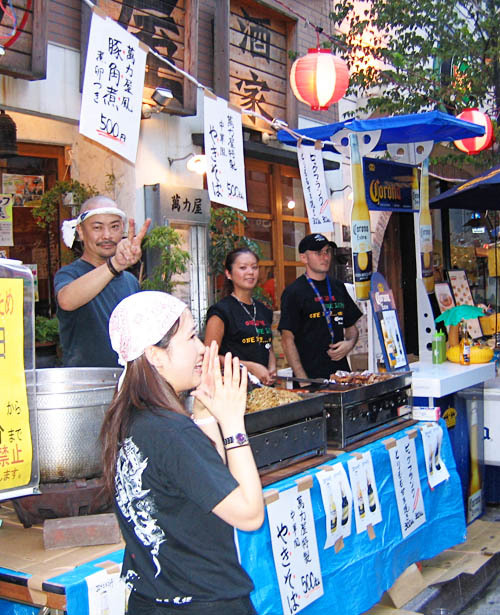 There are always yakisoba vendors at matsuri, frying up large batches of noodles on large flat metal griddles. 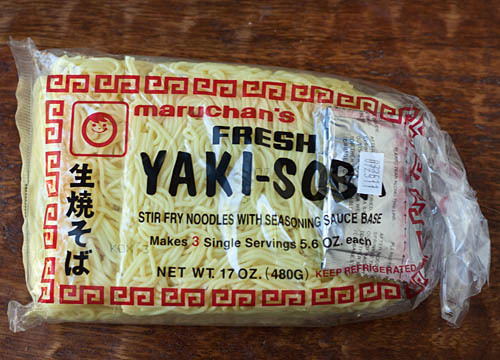 Yakisoba literally translated means “fried noodles.” Although it most likely originates from Chinese chow mein, it has been heavily integrated into Japanese cuisine, and is a very popular noodle dish in Japan. 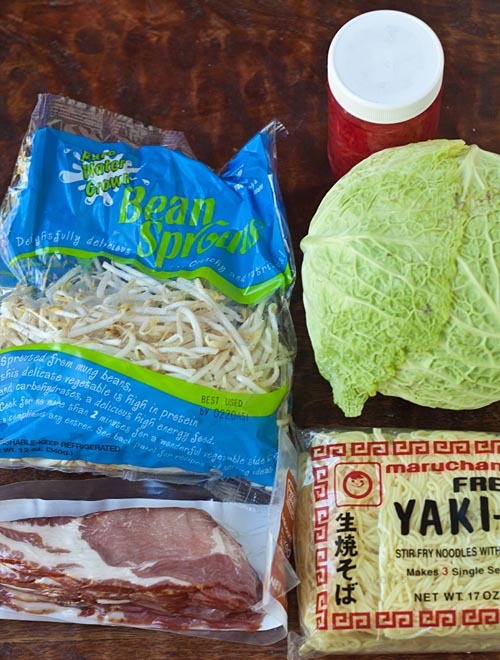 There are many ways to make yakisoba, but my favorite version always includes cabbage, bean sprouts, and some sort of thinly sliced pork. Unlike the name might lead you to believe, yakisoba is not made using soba noodles (made with buckwheat flour), but noodles that are more like ramen noodles (made with wheat flour). 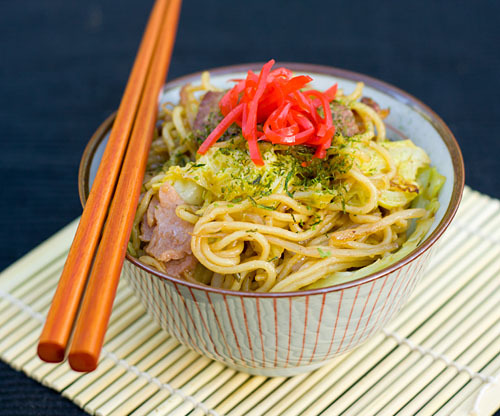 I wrote about yakisoba a few months after moving back to the US in 2008, but have since worked on developing a recipe that reflects the yakisoba from the matsuri that I adore so much. I’ve actually had this recipe sitting in my post queue for over a year, but it has sat there patiently waiting. This week Allison and I worked on a Miso Hungry episode about Japanese summer food, and I decided it was time to finally post my yakisoba. Here’s to celebrating summer! 1. Prepare the sauce: Whisk together the sauce ingredients in a small bowl. Cover and set aside. 2. Heat one tablespoon of oil in a 12-inch skillet or wok and cook the pork until just barely cooked. Using a slotted spoon, transfer the meat to a bowl. 3. Cook the cabbage, bean sprouts, and onion in the same skillet, over medium-high heat until tender, but not browned. While cooking, drizzle in additional oil as needed. 4. Add the noodles to the skillet. Gently toss them to break them up and incorporate them with the rest of the ingredients. When the noodles have warmed through and are starting to crisp, add the cooked meat and half of the sauce and stir until everything is evenly coated. Add additional sauce until you have reached your desired moisture level. Garnish with a pinch of ao nori and beni shoga (optional) and serve immediately. Why did I have to read this just before lunch?! Wonderful post and I have printed the recipe. I’ve been dying for Yakisoba but I have yet find the noodles here in Germany. Now I’m hungry for it, I guess I’ve got to go explore more and see if I can find them. Jordan, I have been using Angel Hair Pasta cooked with baking soda when I can not get Chuka Soba (or ramen noodles). Just add about 1 table spoon of baking soda to boiling water when you boil pasta. Use a very deep pot to avoid water to overflow while cooking. Wash noodles after cooking. 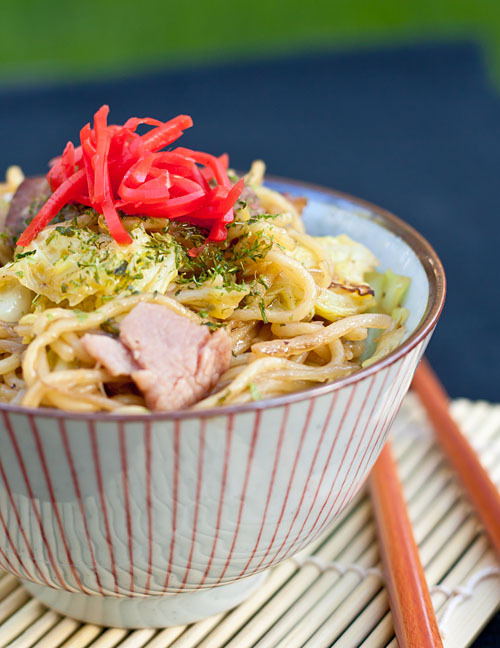 Yakisoba withouth beni-shoga is like Thai curry wituout lemongrass. This is making me want to go back to the Japanese market you so graciously toured us through in San Diego — such a wealth of information. I think trying this recipe is a perfect way to get me started. I’ve been craving a big bowl of noodles. @Ciao Kitty & @Jourdan — Fabulous info Ciao Kitty, thank you for sharing! Jourdan, let us know if you try it out! @cocopuff1212 — I couldn’t agree more! @kellypea — Aaaw, you are so sweet! Yes, I think this is a fantastic way to get started! This looks so incredibly oishii! I will definitely have to follow your recipe. I was just talking to my brother about not being able to find Yakisoba like we’d had when we were kids living in Okinawa. He just picked up some soba noodles and was going to try to find a recipe to cook them. I am sending this on to him. This look so good!! Where did you buy that thinly sliced pork? Making me nostalgic for Japan! 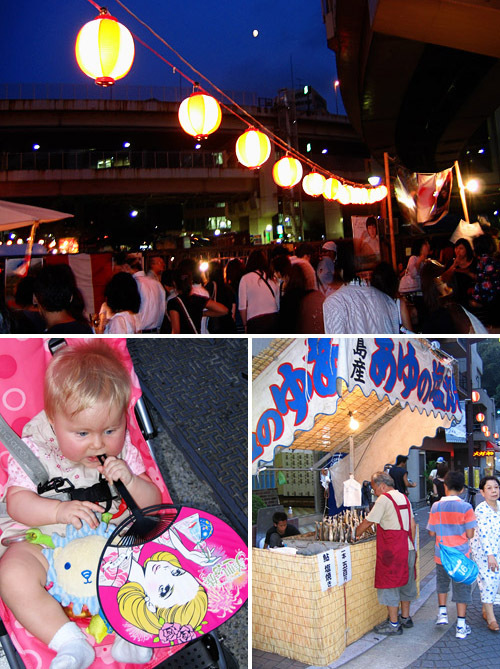 I think you were there the same time as me, I have that fan from my summer matsuri too! WE LOOK FORWARD TO HAVE A SOLID BUSINESS RELATIONSHIP WITH YOU IN THE NEAREST FUTURE. Next post: Endive Cashew Slaw + A Giveaway!